AUSTIN, Texas--(BUSINESS WIRE)--Ben Milam Whiskey, an award-winning boutique distillery in Blanco, TX, is excited to announce that former Jim Beam distiller, Marlene Holmes, has joined the team as head distiller. With more than 27 years of experience in the Kentucky whiskey industry, Holmes joins the Ben Milam team following recent awards recognition that included gold medals for all three products and the illustrious Double Gold for the Single Barrel Bourbon. Marsha Milam, founder of Ben Milam Whiskey, with passion, pride and commitment to her product, inspired Holmes to pursue the position. 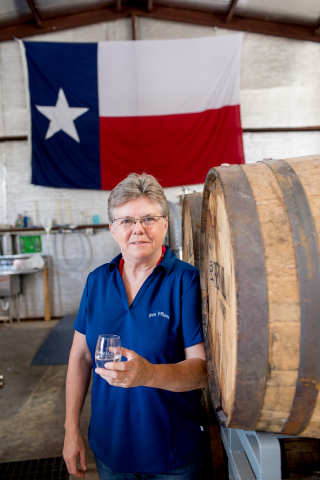 She joined the team just last month after retiring from Jim Beam, and while she was looking to continue her career in the bourbon business, she never imagined calling Texas home. Holmes was in search of a new role that would allow her more creativity and hands-on in the day-to-day after spending extended time in a more computerized environment that often comes with bigger brands. And although Marsha is what initially attracted Holmes to the brand, the product itself is what won her over. Founded by Marsha Milam, the high-quality whiskey pays homage to Texas Revolution hero, Benjamin Rush Milam. This young brand has received gold medals and double gold medals from the San Francisco World Spirits Competition as well as other awards from the Whiskeys of the World Awards, the New York World Wine and Spirits Competition and The Fifty Best. The distillery is on trend to more than double the number of case sales this year and is in the final stages of breaking ground for a new barrelhouse. Holmes plans to continue to help grow the brand and brings with her new ideas, which includes the creation of Ben Milam’s own jug yeast. She explains that similar to Kentucky, Texas’ rolling hills and limestone water helps the brand to fit right in with the bigger whiskey names. Like Texas, pride is a big part of whiskey’s identity, and she is confident Ben Milam will continue to bring a competitive edge to the industry. Ben Milam Whiskey is an award-winning limited production, high-quality whiskey distillery located in Blanco, Texas. The distillery currently offers three products: Ben Milam Single Barrel Bourbon, Ben Milam Barrel Proof Bourbon (limited release) and the Ben Milam Small Batch Rye. Ben Milam Whiskey currently has statewide distribution in Texas and is available at fine liquor stores. For more information visit www.benmilamwhiskey.com. If you're interested in carrying our products, please call 830.833.3033. Ben Milam Whiskey, an award-winning Texas distillery, announces that former Jim Beam distiller, Marlene Holmes, has joined the team as head distiller.